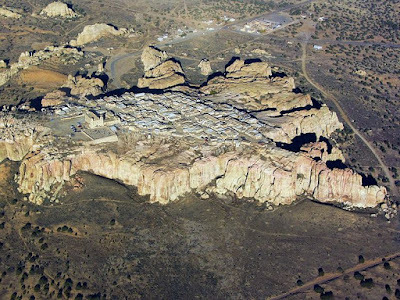 The Acoma Pueblo, perched on the top of a 367 ft. high mesa in the New Mexico desert, is one of the oldest continually inhabited settlements in North America. It is approximately 2,000 years old and is home to the San Esteban del Rey Mission church which was completed in 1640. 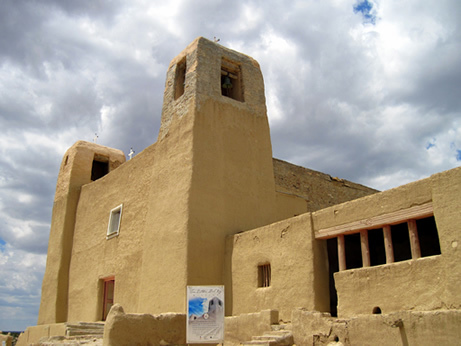 Both the mission and the pueblo are on the National Register of Historic Places and are a site of the National Trust for Historic Preservation. 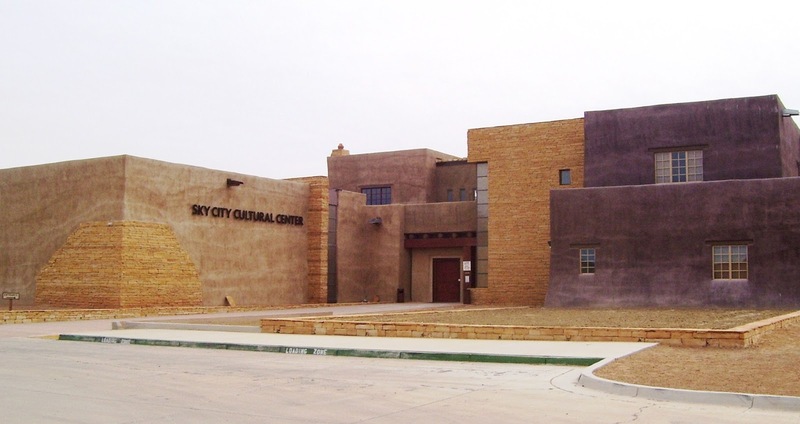 At the base of the mesa sits the Acoma Sky City Cultural Center and Haak'u Museum building and visitor parking. 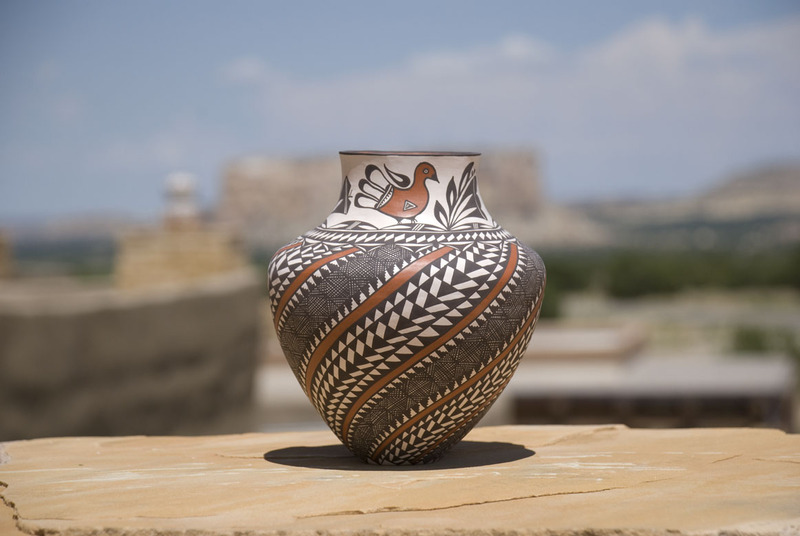 The Museum offers permanent and rotating exhibits focusing on Pueblo history and the preservation of Puebloan art, specifically Acoma's famous pottery. The 40,000 sq. ft. 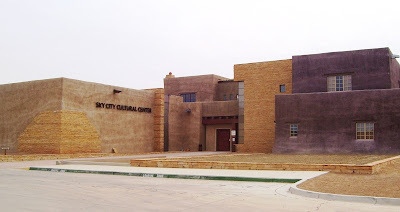 Cultural Center complex includes the Y'aak'a Cafe, which serves traditional Acoman and contemporary southwestern cuisine, the Ts'ikinum'a Theater showing short films on Pueblo history and culture, meeting/event space with catering options, and the Gaits'i Gift Shop. Tours of the Pueblo itself are available daily from the Cultural Center, from 8am to 5pm, but it seems best to call ahead (1-800-747-0181) and register for a tour time and to verify current open hours for the Cultural Center's facilities. The pueblo is continually inhabited by a small group of tribal members, and as such, there are sensitivity issues involved with touring the village. The Acoma people ask that dress should be modest (and mindful of the sometimes extreme weather), pets and smoking are prohibited, and photography is not allowed without a permit. Please read the visitor etiquette page. The tours last an hour and a half and cost $23 for adults, $15 for children. Group tours, family rates, and shorter tours of the mission only are also offered. The Pueblo people celebrate annual feast days that are related to their specific pueblo and mission saint. The feast day of San Esteban is celebrated at Sky City on September 2nd. If you plan to attend, be sure to read up on the specific etiquette rules before you go. Every year in September the Acoma Pueblo also hosts the Tour de Acoma, a series of 25-, 50-, and 100-mile desert bike races. There is also a Luminaria Celebration and dances at the mission church around Christmas. Check the calendar for special events and annual closed days at the pueblo before you schedule your trip. Sky City is about 70 miles west of Albuquerque and a ways off of I-40, but the Acoma do have a casino hotel and an RV park directly off of the interstate, and they offer big game hunting tours on the reservation in the Fall. Cibola County is also home to the longest uninterrupted stretch of historic Route 66 in New Mexico, which runs immediately to the north of the Casino as State Highway 124. Pueblo city is a great place with good people. This city offers something for everyone. You must want to visit again and again to this place.